Let's cut to the heart of the matter: First, let's start by setting aside the extraordinary complexity of thousands of pages of health reform legislation. Next, let's throw out the labyrinth of details about the Senate reconciliation process. Not important. Only one thing matters. President Obama must convince the House to pass the Senate bill. Everything else, including any separate legislation passed through the budget reconciliation process, is a side show at best. If the House passes the Senate bill in a straight up or down vote — "a simple majority," to quote the president — ObamaCare becomes the law of the land. Nothing else matters. The president wants the House to act by March 18, promising that problems would be fixed in subsequent legislation. But if the House passes the Senate bill, then President Obama would be able to sign comprehensive health reform in the form of the Senate bill the next day, and the job is done. Any promises that it would be fixed after that aren't worth the paper they might, or might not, be written on. The White House is desperately trying to find every vote possible to get to the current majority number of 216 votes in the House to pass ObamaCare. The president cleared his schedule this afternoon for marathon meetings with House members. Rep. Bart Stupak, Democrat of Michigan, said on ABC this morning that he and 11 colleagues who voted for the earlier version of the House bill will vote "no" this time if abortion language isn't changed from the Senate version. "Let's face it, I want to see health care," Stupak said. "But we're not going to bypass some principles and beliefs that we feel strongly about." But they and others are being told that if they want health reform, they have to take the first vote so the leadership has a bill to fix. The package of fixes being negotiated between the House and the Senate is a distraction at best. Once House members take the vote on the Senate bill, they have absolutely no control over what the Senate does next. The Senate may or may not be able to get a second bill passed to address concerns of the House. The Cornhusker Kickback, the Louisiana Purchase, and every other vote-buying deal buried in the Senate bill. Abortion language that clearly allows federal funding for abortion and which the U.S. Conference of Bishops solidly opposes. The Cadillac tax on high-cost health insurance policies that labor unions hate. Weak enforcement provisions for the individual mandate that health insurers say will cause pools to disintegrate, causing premiums to skyrocket for those still buying policies. It would be the dupe of all time if House members were to be convinced that they must go first to keep the process moving forward, only to find that ObamaCare passes the finish line in the form of the Senate bill. It will be interesting to watch them this fall trying to explain to constituents, who already have told them in no uncertain terms that they hate this legislation, that they were promised that they would have a second chance to take a vote to fix it. In this game, there will be no second chances. Pickett's Charge: President Obama's speech on Wednesday was anything but the game-changer congressional leaders desperately needed. He offered not a single new idea, and he trashed bipartisanship by suggesting his health overhaul be passed through the ultra-partisan reconciliation process. The Washington Examiner aptly called this all-or-nothing gambit "Pickett's Charge." Worse, the president argued for his plan by dusting off the same arguments he's been using for a year but which have since been discredited by numerous independent studies — that you can keep your current coverage, health costs will be lower, and the deficit is reduced. President Obama: "If you like your plan, you can keep your plan." The steep cuts in Medicare Advantage he supports would mean at least one-third of seniors could lose their comprehensive Medicare Advantage coverage as their plans are forced to withdraw from the program, cut their benefits, or raise premiums. In addition, at least 10 million people with employer-sponsored insurance could lose their current coverage, according to the Congressional Budget Office. Mr. Obama himself acknowledged at last week's health reform summit that "eight to nine million people…might have to change their coverage." President Obama said his plan will "bring down the cost of health care for millions — families, businesses, and the federal government." CBO says health insurance premiums will continue their steady upward climb under the Senate bill. Families purchasing insurance in the individual market would see an increase of $2,100 in the year 2016, over and above increases they already will be facing. That means those families would be paying $15,200 in 2016 for health insurance if the Senate bill passes, and $13,100 if it doesn't. Families who get health insurance through small businesses will be paying $19,200 in six years, and those working for large firms, $20,100. PricewaterhouseCoopers released a study, commissioned by America's Health Insurance Plans, which showed the cost of a family plan in 2019 would be $4,000 a year higher if reform passes. And Chief Medicare Actuary Rick Foster estimates that, under the Senate bill, "Federal expenditures would increase by a net total of $279 billion" between 2010 and 2019. So his plan would cost families, businesses, and the federal government more, not less. President Obama says his plan "brings down our deficit." Congressional leaders hammered the CBO into submission as they drafted their legislation, using the CBO's scoring tactics against them to pretend the legislation reduces the deficit. But former CBO Director Doug Holtz-Eakin concludes the bills "can claim to be deficit-neutral only because during its first decade it offers 10 years of taxes compared with six years of subsidies. "The Republican staff of the Senate Budget Committee estimates that, fully implemented, Democratic legislation would cost $2.4 trillion over 10 years, nearly three times the cost projected by the Congressional Budget Office," Holtz-Eakin said. This would significantly expand, not shrink, the deficit. Further, CBO shows the Senate bill double-counts Medicare savings. Savings to the Medicare program "would be received by the government only once … they cannot be set aside to pay for future Medicare spending and, at the same time, pay for current spending on other parts of the legislation or on other programs." Medicare Chief Actuary Richard Foster makes the same point: A series of accounting maneuvers makes it appear that Medicare's Part A trust fund would be in better shape under the Senate bill that is the basis of the president's plan, but that's not so. "In practice, the improved Part A financing cannot be simultaneously used to finance other Federal outlays (such as the coverage expansion under [the Senate bill]) and to extend the trust fund," Foster writes. bill requires in order to get its deficit score would "represent an exceedingly difficult challenge." So just on these three examples – keeping your current coverage, lowering costs, and reducing the deficit – the president is wrong. It is though he simply dusted off the same speech he has been giving for a year, using arguments that have been proven as inaccurate by independent studies and analyses, and hoping that maybe, just maybe, this time the speech will work. The president and his aides may twist arms and torture Congress into passing ObamaCare, but the more he tries to force this into law, the more the American people will reject it. The White House is dreaming if they think people will ultimately accept a plan they clearly oppose. Ryan's Charge: Our video of the week features remarks by Rep. Paul Ryan at last week's summit that is a must-view if you haven't seen it. The Wall Street Journal today publishes excerpts from his point-by-point critique of the claims the president is making about his health plan. In the paper's lead editorial, "Paul Ryan v. the President," also today, the Journal concludes, "The President was (miraculously) struck dumb by Mr. Ryan's critique." It was an astonishing moment. Neither the president nor his advisers laid a glove on Ryan's fact-based analysis. Ryan absolutely agreed that health reform is essential — for individuals and families, businesses, and the government — but he cited independent analyses of the Senate bill (which is the basis for Mr. Obama's plan) that show, "This bill does not control costs. This bill does not reduce deficits. Instead, this bill adds a new health care entitlement when we have no idea how to pay for the entitlements we already have." And Ryan added, "It bends the cost curve up, not down." The American people are engaged as never before in the health reform debate. They are focusing on the details. They know that the numbers just don't add up and that the legislation itself breaks the promises the president is making. White House Press Secretary Robert Gibbs said today the next step is for the House to pass the Senate bill so the process of reconciliation can move forward. The President says he wants this to happen by March 18 — two weeks from now. The American people are watching in utter amazement as the Congress makes plans to pass health reform in a stealth maneuver in full view of the American people. 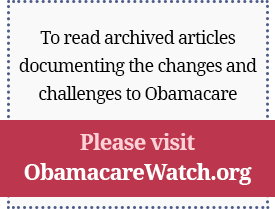 VISIT HEALTH REFORM HUB FOR THE LATEST OP-EDS, BLOGS, AND VIDEOS. Congressman Paul Ryan of Wisconsin has been a prominent advocate for the rights of America's health consumers in the ongoing health reform debate. He has also been a great friend of the Galen Institute, appearing as a keynote speaker at our "Value of Innovation in Health Care" conference this past December (audio of Congressman Ryan's keynote speech can be found here). In this week's "Clip of the Week", Congressman Ryan offers his thoughts on President Obama's health overhaul at the Blair House Health Reform Summit, challenging the president's statement that his health reform plan will not add to the federal deficit.